We rarely change when we see the light. We change when we feel the heat. “We know that in all things God works for the good of those who love him” (Romans 8:28 NIV). Grief, loss, and pain are an inevitable part of life. But did you know that God uses these things to help us grow? He does it in three ways. First, God uses pain to get our attention. C. S. Lewis wrote, “God whispers to us in our pleasures, speaks in our conscience, but shouts in our pain.” Pain is God’s megaphone. We rarely change when we see the light. We change when we feel the heat. Proverbs 20:30 says, “Sometimes it takes a painful experience to make us change our ways” (GNT). When you experience a loss, it’s an opportunity to grow in character. 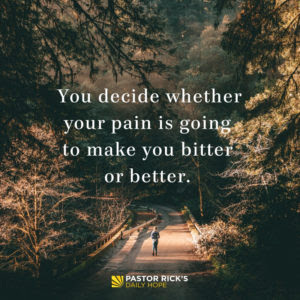 You can’t control the pain you go through, but you can decide whether it’s going to make you bitter or better. You decide whether it’s going to be a stepping-stone or a stumbling block. You have to remember that even in your pain, God is working for your good. Third, God prepares us for eternity. The Bible says in 2 Corinthians 4:17-18, “These little troubles are getting us ready for an eternal glory that will make all our troubles seem like nothing. Things that are seen don’t last forever, but things that are not seen are eternal. That’s why we keep our minds on the things that cannot be seen” (CEV). You’ve probably heard me say before that you’re not taking your car to heaven. You’re not taking your china or your clothes to heaven; you’re not taking your career to heaven. But you are taking your character. You are taking you. God’s more interested in your character development than in your comfort. Why? Because you can get comfortable in heaven, but this is the get-ready stage. This is the learning stage. This is the warm-up act. 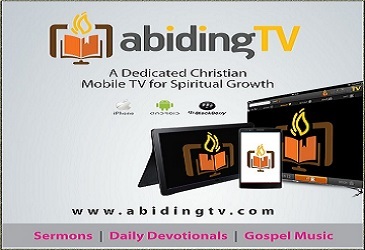 God uses your troubles here on Earth to get you ready for an eternal glory. That’s a comfort. When you’re in pain, you need to ask, “What is God doing?” Is he trying to get your attention? Is he trying to bring good out of bad? Is he preparing your character for heaven? What does it mean that God is working for your good? Does it mean that God only lets good things happen to believers? Why is it often easier to focus on today’s realities than on the promise of heaven? How can you prepare yourself now so that you are ready to hear from God when you are in a time of pain?